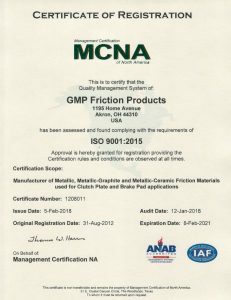 As part of our ongoing commitment to improve our Business Processes and Customer Satisfaction, GMP Friction Products has acquired approval for registration to ISO 9001:2015! Congratulations to the GMP Friction Products Team for this achievement! And THANK YOU to our customers for the opportunities to be of service to you!